their efforts mightily. Kudos to SkyTeam for quietly rolling out a program that now allows travelers on SkyTeam airlines to be rebooked by an agent on other SkyTeam airlines right in their own systems. I spoke with SkyTeam CEO and Managing Director Perry Cantarutti about the new program. There was a soft launch of this so-called SkyTeam Rebooking product back in November, but now the first phase is complete and operational. This system allows agents in 43 airports (and it should be for any SkyTeam airline in each airport) to access reservations on any SkyTeam member airline for rebooking purposes. Here’s the list of where this is live. I imagine that, as was the case for me, there’s one thing that stands out here in this list. There is no coverage in the US and that seems like a gaping hole. But fear not, that’s coming in phase two. Delta hubs should be on-line later this year. There are currently some call centers with access, but this is primarily an airport tool and it’s meant to be used within 48 hours of departure. Here’s how it works. SkyTeam put together a system which connects Sabre, Amadeus, TravelSky, and Deltamatic. Apparently all SkyTeam airlines are on one of those four systems. Airlines in Sabre, Amadeus, or TravelSky can now port into any of the other systems to access reservations and tickets directly. Right now, Deltamatic can’t access the other systems, and that’s why the rollout in the US isn’t until later this year. That’s when the bridge will have been built to allow Deltamatic users access, so travelers in US airports can benefit. Let’s take a look at an example. Let’s say you’re flying from Bucharest to Munich on TAROM and then connecting to Delta on to Atlanta. And let’s say you have a ticket issued by Delta (or by a travel agent on Delta ticket stock). Then let’s say TAROM cancels the flight to Munich. And… action…. In this new system, the agent simply types in a command and can use an interface to the airline’s system that has the ticket stock. In this case, that’s a TAROM agent accessing Delta. Any entry in the TAROM reservations system gets translated into Delta-speak in the Delta system behind the scenes, so the agent doesn’t have to learn a new system. The agent can just go in, sell the new flights, and reissue the ticket all right there without talking to anyone. There’s no coordination required, so it’s really fast. SkyTeam didn’t have exact numbers (or didn’t want to share), but in the first full month of use during the soft launch, last December, there were “several thousand” reservations that were processed using the system. This is the kind of cooperation that makes alliances useful. It’s a big step up from a standard interline agreement, and while it’s not a joint venture, this is the kind of thing that joint ventures within alliances can also use to their advantage. How I wish that Oneworld will do the same. Even when calling AA about a AA flight (on Finnair metal) turns into a laborious process. Cranky: forgive me if I’m missing something but doesn’t One World do this already? Last year I was booked on Air Berlin from JFK to Rome and back, connecting through Dusseldorf out and Berlin on the return. The connecting flights were on Alitalia. 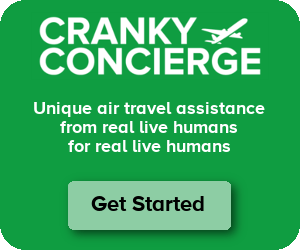 Given the high risk of both airlines failing I bought your Concierge service and needed it on the outbound. Due to a mechanical, AB cancelled it’s JFK/DUS flight and your team sprang into action. We were rebooked on BA via LHR to Rome. This was not a case of Etihad partnerships as BA does not have that, I believe. So was it One Workd playing nice? I think you had the benefit of the Cranky in your corner. I am a OneWorld top elite and anytime something goes oddly with BA, AA, or IB it just a mess of folks talking back and forth. I have sat in lounges (Madrid, Heathrow, Prague) before just waiting for them to get back to me because a downstream flight changed. I live in a OneWorld fortress hub and still have trouble getting them to all work together when something goes wrong. Maarten – They all allow that to happen, but it’s not so simple from a technical perspective. We had to work with the airlines to get it done. You just didn’t have to worry about it since we were on the case! Noahkimmel – Revenue gets split based on which airlines are flown and which coupons are lifted. The airlines will still have preferences that they can enforce with their agents. So JV comes first. This just makes the transaction easier. I think there are certain cases where an airline can take over a partner’s ticket — Delta and KLM can definitely take over each others’ tickets for example, but that is based on a very deep relationship. But it’s not an option for any two random airlines across the alliance. Must depend on the alliance, since oneworld airlines have long had a standing agreement that they can treat another member airline’s ticket as their own (with exceptions like awards etc). Even restrictions go out the window for involuntary situations. Accessing the other PNR isn’t always possible, but accessing the etkt and using it is easy. I actually had a good experience on sky team two years ago. I was on a AF Award ticket on Delta DCA – MAD and the DCA flights were late making connections in JFK not work. First the options offered in Delta’s automated email were not good, and calling in was no better. So we were sitting around at the airport trying to figure out how it would work, and all the options in the email no longer were available, but then we got an email with a new itinerary, DCA – JFK later than expected, then Delta to LIS, then on to MAD on Iberia (! )… I have to think someone on the AF team noticed the problem and make everything work including flaying a One World Airline to make the connection… I attributed that good experience to AF not Delta. That was likely Delta, though, since it was day of departure. I think your example doesn’t make much sense since all the systems you list already have type-A and type-B messaging available to make rebooking possible. On day of departure, it doesn’t matter who the plating carrier is, the carrier responsible for the cancellation can ALWAYS take control of an e-ticket in the appropriate status (open or checked-in) and reissue an INVOL ticket under their plating code. I think the only way this tool is beneficial is if say, a passenger books their tickets separately on two or more Skyteam carriers, where carrier A is not involved with the ticket for connection carrier B. Carrier A cancels and needs to rebook but has no record of an onward connection, but with this tool would be able to go in a handle a reroute. I don’t know, this tool seems like a huge waste of effort, and if there were issues they should have just focused on training agents better. The point is they can rebook ACROSS SkyTeam. So if you bought a flight on Expedia.com, ticketed on Delta, and your TAROM segment is cancelled, you can be rebooked on KLM. Previously, that would have been a mess to sort out. Does Delta really have its own system called Deltamatic? Don’t some of those smaller Skyteam members run on SITA’s systems? JP – I don’t know the details. All I know is what the SkyTeam people told me. Anyone know if that’s not correct?